I guess it’s a relief to discover that Artist Director Bill Rauch can stumble as a director. After seeing one amazing Rauch production after another, year in and year out, it is cathartic to experience a badly-focused, inconsistent performance in which many actors and crafts still excel but which, overall, disappoints. Bill Rauch is a fallible human after all. The intimate space of the Thomas Theater is perfect for the play’s intense family interactions.Unfortunately, there is no uniting vision in this production, and so even a very good Lear — played by Jack Willis at the production I saw — couldn’t create a coherent or compelling narrative. A major weakness is Sofia Jean Gomez’s Cordelia. Gomez didn’t show power on stage. In the opening scenes where the “good” daughters Goneril (Vilma Silva) and Regan (Robin Goodrin Nordli) are supposed to cynically kiss up to their father while the really pure and loving Cordelia refuses to spew platitudes of affection, Gomez’ character comes off as oddly standoffish. She’s truly cold, not virtuous. In fact, Goneril and Regan are played so convincingly that, if you didn’t know what was coming, you would have thought that the old king was correct in how he divided his kingdom. Gomez completely failed to communicate her character’s love and honesty. The opening scene, designed to set up the whole story, was botched. How can a director of Rauch’s caliber fail to get a key plot point in front of the audience? Speaking of pointlessness, two bits of stage-craftlessness annoyed throughout the evening. The most universally distracting issue was the hodge-podge, phony, inconsistent, not-from-any-country-on-this-planet accents of any character who was supposed to be French. First, there is no need to put on an accent to convey that you are from a different faction or country. The text supplies that information and there are better, more subtle ways of reinforcing the foreignness, if you need to go there. But, seriously. If you are going to have your French characters have an accent, could it be French (best choice) or at least the same from character to character? The Jamaican patois of one actors was most out of place for me, but the whole mishmash from Tony DeBruno and every other “French” character was just terrible. The only voice missing was that of Pepe Le Pew. Didn’t the director LISTEN to the production he created? The other serious distraction were the costumes designed thrown out on stage by Linda Roethke. Some characters were dressed in almost-modern generic royalwear. But, others (army officers? ), were made to wear cartoonish outfits whose look was stolen from Captain Crunch cereal boxes. Still others (mostly ensemble) wore black coveralls that reminded me of maintenance workers in Sci-Fi flicks. Yeah, the differences among the classes of people were sometimes reflected in the category of dress they wore. But, the differences didn’t make sense. Moreover, at least one costume was poorly made: royal Regan in one court scene is draped in an ill-fitting, poorly put together white thing which made her look like the unfortunate model paired with a Project Runway loser. Costumes were yet another part of the production that didn’t hang together. And, Rauch allowed a striking, straight-forward continuity error. This production starts off with Lear acting like an alcoholic. He’s guzzling whiskey during the initial tiff with Cordelia, and there’s a glass at hand during most of his early scenes. Lear’s rages caused by alcohol: an interesting take! But, as Lear descends into deeper psychosis the alcohol simply disappears. The old drunk neither renounces booze nor falls into the bottle. The initial cause of his irrationality simply disappears. Huh? How likely is it for an alcoholic to neither hit bottom nor to succumb to chemically assisted insanity? Director Rauch, what happened? In another judgment mistake, this time as Artistic Director, Rauch decided to switch out actors playing Lear, alternating between Willis and Michael Winters in successive performances . It’s a move that feels contrived to get the audience to buy two tickets to basically one production. Maybe if Lear was simply better I would have been tempted to see a different take on the title character. But, Rauch’s work doesn’t wow, and the different actors on different nights instead feels like a sleazy marketing gimmick. Willis, Silva, and Nordli deserve their praise in previous paragraphs, but Richard Elmore as old Gloucester is the standout performance of the evening. From the start to his terrible end, Elmore’s character retains a distinct personality. Elmore’s reliable underplaying creates both tension and meaning when he is powerful and, later, when he is blinded and begging. In a role which could devolve into hysterics, Elmore instead delivers honor. Daisuke Tsuji as the Fool hit just the right tone, mixing a high level of playful energy with dangerous truth telling. Tsuji slapped the audience with his wit. Several times at the production I saw he wove in references to fire alarms — that night Lear had opened 15 minutes late because of a false one. Yet, his Fool easily converted to a loyal and feeling caretaker when appropriate, a split second later in the scene. Armando Duran as the Earl of Kent in his different disguises also delivered an excellent character. He kept the Earl’s emotional currents and eddies of anger all flowing in the same direction. Similarly, Benjamin Pelteson shone as Gloucester’s loyal son Edgar. Even in his crazy moments, this Edgar was on track and accessible. Rex Young as the Earl of Cornwall rounds out the list of well played royals. Young was consistent, evil, and deserving of hatred. 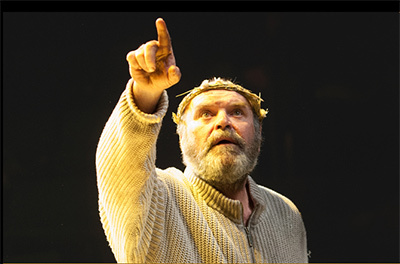 I participated in the mostly standing ovation in appreciation of Elmore, Willis, Tsuji, Siva, Nordli, Pelteson, Young, Acebo, and the others who tacked together in the director-less storm that was this King Lear. It was an evening well spent, but an evening which should have been so much better.